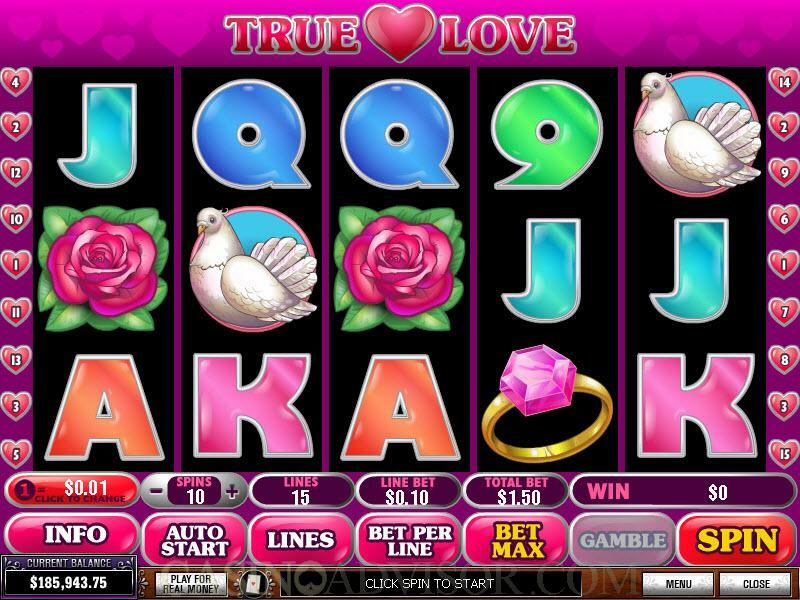 True Love is the perfect Valentines Day slot game. There is an excess of shades of red and pink. The other colors are in bright shades as well. The payline buttons are heart shaped. All the symbols on the reels are evocative of romance. The wild symbol is Cupid and the scatter symbol is the Girl, presumably the True Love. The other symbols are Dove, Violin, Ring, heart shaped Candies and red Rose. The high value card symbols from 9 to A are in bright colors. 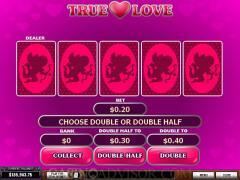 Eight coin denominations are offered in the True Love slot game. These are 0.01, 0.05, 0.10, 0.25, 0.50, 1.00, 2.00 and 5.00. Low rollers have more options than high rollers. There are 15 paylines, which is less than the number usually offered in contemporary slots. The players can wager up to 10 coins per payline. The line bet range varies from 0.01 to 50.00 credits. The total bet per spin varies from 0.01 to 750.00 credits. 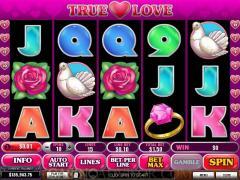 True love offers a number of features like Auto Play, Bet Max button, full screen mode and audio disabling. Cupid is the wild symbol. It doubles payouts when it helps make winning combinations. On its own it offers line payouts when two or more appear aligned left to right in enabled paylines. If all five reels have the wild symbol then the jackpot payout is 10,000 coins. The Girl is the scatter symbol. When two or more of these symbols appear anywhere on the reels then they result in scatter payouts. When three or more scatter symbols appear anywhere on the reels then the free spins round is triggered. This round is announced by the animation of the girl dancing across the middle row. The player gets 15 free spins with a multiplier of 3x. The free spins can be retriggered infinitely. 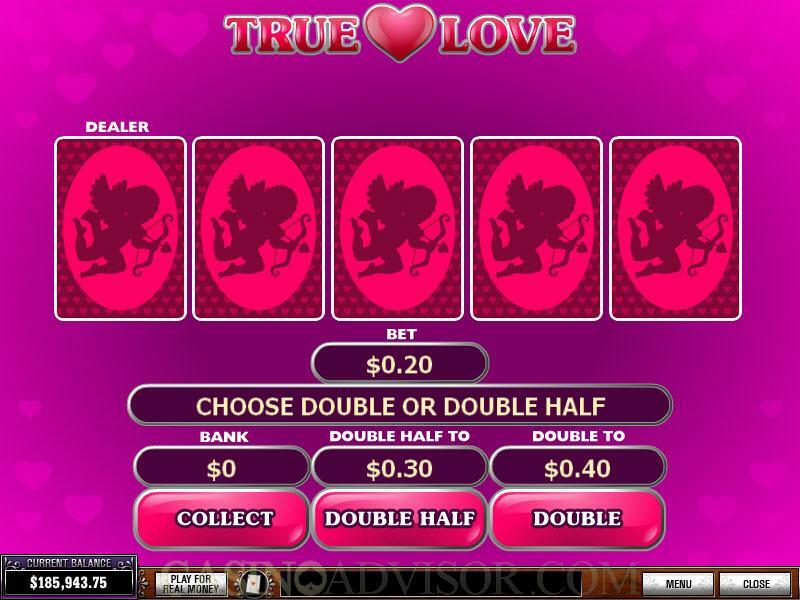 True Love offers a Gamble Game that gives players three options. They can bypass the Gamble Game by clicking the Collect button and take the payout won. By clicking the Double Half button players collect half of their payout and wager half in the Gamble Game. By clicking the Double button players wager their entire payout in the Gamble Game. In the Gamble Game the dealer’s card is dealt face up and four cards are dealt face down. The player chooses one of the face down cards. If that card is higher ranked than the dealer’s card the player doubles his staked amount. Otherwise he loses his stake. If the player wins he can keep playing the gamble game till the limit of 1500.00 credits is reached. Interested in reading more detailed information about True Love? If so Click Here for more details.